HomeAgain has announced that Snoopy, the iconic cartoon pooch, has a starring role in an iPhone application to help HomeAgain Pet Recovery Service reunite pet parents with lost microchipped pets. Animal lovers have at their fingertips a handy way to participate in the nationwide HomeAgain PetRescuers network through the new, free app on the Apple iPhone and similar devices including the iPad. The GPS-enabled app has many features that give pet lovers access to detailed information in the hopes of facilitating happy reunions. With the app, users can receive alerts about pets missing in a specific local area complete with photos and detailed descriptions of an animal's physical characteristics as well as any guidance provided by the pet owner about its expected response to strangers or other distinctive "personality" traits. The app provides general information useful when dealing with unfamiliar animals in unusual circumstances. 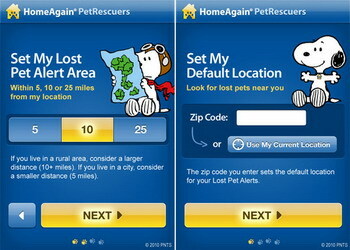 Additionally, heartwarming tales of lost pets returned home, shared by grateful pet owners, can be accessed via the app. PetRescuers by HomeAgain for iPhone is available for download FREE on the App Store in the Lifestyle category. 0 comments on "Snoopy has a starring role in HomeAgain Pet Recovery Service iPhone app"